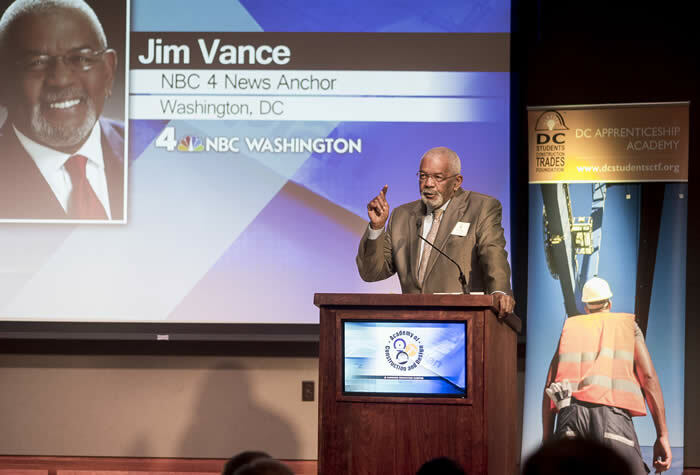 Listen to acclaimed NBC4 news anchor Jim Vance for a few minutes, and you’ll quickly discover the unexpected. He didn’t initially want to go to college. He was raised in a family of plumbers. And to this day, he loves the smell of a construction site. Ultimately, Vance did go to college, attending Cheyney University in Pennsylvania before becoming a teacher, and later, a journalist. But he never forgot his family roots, entrenched in plumbing and the construction trades. Get Over It. Vance credits this helpful nugget to his grandfather, who at 87 years old and 5 feet 6 inches tall once strapped a bathtub to his body and carried it upstairs. So when interns at thetelevision station where he works complain about their tasks, he remembers – and tells – this story. The lesson: Don’t gripe and complain about the workload, just do it. Good Enough Isn’t Good Enough. In life, you will be measured by the quality of your work, so do good work. Don’t get angry when others demand better of you. Instead, work to impress. “Honor yourself by the work that you do,” said Vance. R.E.S.P.E.C.T. Respect your women and men because they are probably your best allies – and always respect your elders. “When we are asking more of you, all we’re trying to do is make you better. All we’re trying to do is show you how much we love you,” he said. Be Careful of the Friends You Keep. “Everybody that calls you brother is not your friend,” stressed Vance. You are a reflection of the company you keep, he continued, so choose people in your life who are uplifting and joyful of your accomplishments. Be Engaged In This World. While working to put food on the table is important, so is expanding the scope of your consciousness to include interests such as politics. “If you’re not engaged, you have no right to complain,” he said. Read, Young People. Vance urged the grads to read and know their history so others can’t limit their vision of what is true. Be a Savvy Saver. Get in the habit of saving for the future. So if you have a dollar in your pocket, said Vance, put a dime aside. Don’t Play the Blame Game. Take responsibility for what’s wrong in your life and take steps to fix it. “It ain’t the man’s problem that you’re not on the top of the world right now,” he said. Man Up! Vance urged young people to take responsibility for themselves as they move forward in life.